Imagine going to bed at night and waking up the next morning with money in the bank. It might sound like pie-in-the-sky or a scam, but in fact, it is possible to create a home business that works for you even while you’re sleeping, spending time with family, or doing any other activity. Often referred to passive income, the term is a bit of misnomer. 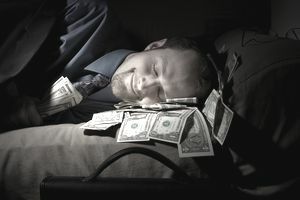 Yes, you can make money while you sleep, but it’s not as simple as set-it-and-forget-it. It takes planning and systems to generate money while doing nothing. Essentially, passive income involves making money on something after the initial investment of time or money. For example, if you buy stocks, they can earn (or lose) money once you've made the purchase (money investment). Or, if you write a hit song, you can continue to make money each time that song is played. You invested time to write it once, and it continues to make money. While passive income does involve an initial investment of time and/or money, once you have it created, they can be maintained with minimal effort. If you’re interested in creating a business that works even when you’re not, here are a few ideas. The trick to success in blogging, aside from regular quality content, is marketing to increase readership. For the most passive efforts, you can use SEO so that search engines can help deliver traffic to you. However, it's good to have a variety of other marketing options, many of which can involve systems and automation such as email marketing and social media. Every business website or blog should have an email list, but not every email list needs a large website or blog. In fact, with a squeeze or landing page, and a thank you page, you can build passive income through an email list. Like a blog, your email newsletter should provide helpful information or tips, because people don’t subscribe to be sold stuff. However, along with your articles and tips, you can promote affiliate products, your products, sell ad space, and even get a sponsor. You can make your email list even more hands-off by using an auto-responder or a campaign. You spend the time in advance writing and setting up the emails, and then the list service does all the work, sending your emails to subscribers week after week, month after month. This works best with evergreen content, as opposed to trending ideas and news. For example, you can set up a 52-week (one year) email newsletter about gluten-free cooking or fitness over fifty. Just pre-write and set up the emails in the auto-responder or campaing, and subscribers get the information automatically each week. Like blogging, your ongoing work will be to market your email newsletter to get subscribers. Creating ebooks, online courses, and other digital content is one of the best ways to make money while you sleep. While they’re time-intensive to create, once you’ve made them and have set up the system for selling them (i.e. website or Amazon), all that’s left is marketing. Like an email list, the system does everything automatically. The system takes the order, processes the payment, and delivers the digital product. You can even create an affiliate program, so you can have a team of people selling for you, duplicating your efforts, and increasing your marketing reach exponentially. If you use a service such as ClickBank to manage your affiliate program, you don’t even have to cut the affiliate checks. Clickbank will do that for you. But like all online income options, success in making information products only comes by having a product people want or need, and marketing to get sales. It wouldn’t seem like selling a tangible product would be a passive income source, but with a drop shipping business it can be. Drop shippers supply everything; the product, the packaging, and shipping, including using your business label. All you have to do is market the product. There are a variety of ways to market a dropship product, including through your website, an e-commerce site, through eBay, or Amazon's fullment program. Further, dropship options now include print-on-demand, which means you can design t-shirts, mugs, and other items that are customizable, and sell them through dropship methods. The downside to drop shipping is ensuring inventory, quality of the product, and on occasion, high wholesale rates. With that said, if you don’t want to hassle with inventory or shipping, drop shipping can be a great option. Royalties are most associated with books and music, and are essentially earned percentages of sales. For example, if you write a book, a publisher can offer to publish it, and will pay you royalties (a percentage of the sale) for each book sold. Of all the passive income options, this is the most elusive. First, getting a publisher or another company to buy and sell your creative work is tough. Further, the amount you earn per sale is often very low; perhaps a few cents off a $10 sale. Finally, at least in book publishing, royalties are usually paid only every six months and only if you’ve out-earned any advance you might have received. An advance is like a loan and it needs to be paid back first before you start getting paid. Another option is self-publishing, in which you’re the publisher. Royalty rates for self-publishing an ebook through a store like Amazon tends to be higher (30 to 70 percent) and is paid monthly. There’s no advance, and you’ll need to spend money on editing and other book prep services, but in the long run, you may find you earn more.